Inside you will find our most up-to-date listing of courses, textbooks, and reference materials. 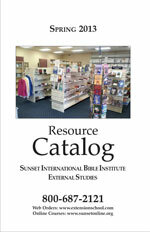 The catalog also has a large assortment of other DVDs, CDs, and print materials. These include older Sunset classroom classes, topical studies, sermon series, messages from the Sunset Church of Christ pulpit, commentaries, reference works, popular books on many subjects, and Sunset materials available in Spanish.